It’s a cold March afternoon and a fierce wind is blowing, but Mark Lovretin and 9 month old Rocket are both looking happy and relaxed. They’ve just returned from a brisk 3+ mile walk on the trails around St. Hubert’s, and this energetic pit mix pup will sleep well tonight. 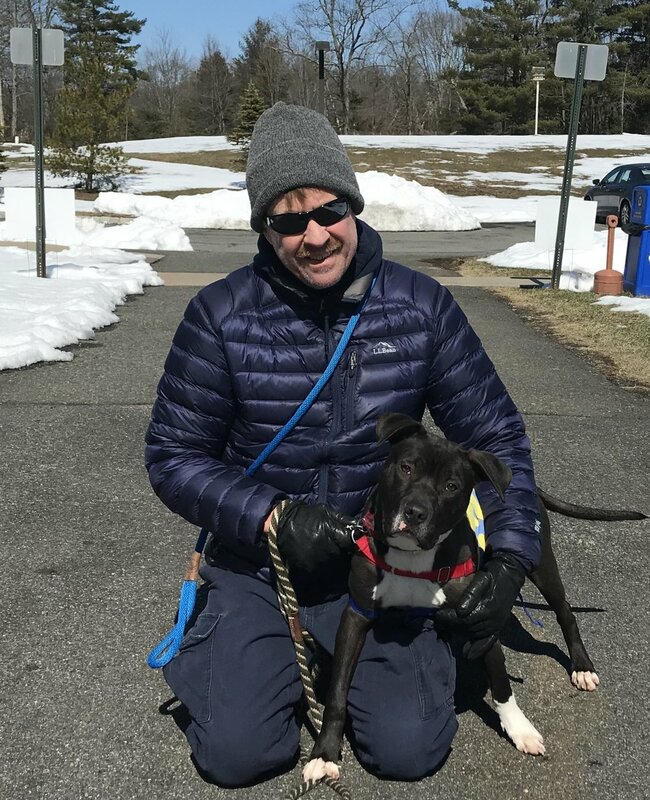 Because of his breed and energy level, Rocket may need a little help getting adopted, and that makes him exactly the kind of dog Mark loves to walk and advocate for. In addition to letting Rocket work off his puppy energy, Mark carefully observes his reaction to other dogs, bicyclists, kids, etc., and will be able to offer valuable insight to staff and potential adopters. He also works on basic obedience training. Countless dogs have benefited from his care and attention. Mark started volunteering at St. Hubert’s in 2009. His cat had passed away and he was thinking about adopting another, so helping out in the cattery was a natural fit. A talented photographer, Mark began taking pics of the cats and serving as a feline adoption counselor. A few years later he added dog walking to his expanding volunteer role, and became lead volunteer photographer. He also serves as a dog walking mentor for new volunteers. All this plus a full-time job at PSE&G. Growing up with both cats and dogs, Mark loves them equally. (One early pic includes the cat sharing his crib and another shows Mark on the ground, flattened by the family dog). He soldiers though a slight allergy to cats, and counsels other mildly allergic volunteers that spending time with cats can actually help. He has three at home. Mark is an exceptional volunteer and an effective and compassionate advocate who is always willing to go the extra mile for the animals at St. Hubert’s. We are lucky to have him!